Online content is one of the biggest assets your online business can own and that is why you need to invest in quality copywriting services. When your content is fresh and engaging it not only attracts the attention of your target audience, but Google too. Well, those clever people at Google (although other search engines are available!) work hard to match users’ search terms with relevant websites. If your website doesn’t contain the search keywords and phrases web users are looking for, you simply won’t appear in their search results. At Baldwin Digital, we understand the importance of good copywriting and the multiple channels you can use to get your message heard. We will work closely with your business to understand that message and your target audience perfectly. The result from our copywriting services is engaging copy, more visitors and most importantly, more conversions. Your website might have all the bells and whistles, but without good content those features may not be seen by anybody. We will optimise your web pages to ensure they are indexed effectively by the search engines and that they give you the best return on your investment. Online articles can be a great way to gain trust from your target audience. Giving them advice, news and other useful information will make you an authority on your industry or chosen topic and the website your visitors are most likely to come back to. Social media has burst onto the digital marketing scene in a huge way and you could be missing out on hundreds and even thousands of new leads if you are not part of it. We can take care of your Facebook updates and your Twitter tweets and ensure we keep your social media buzzing about your brand, services and products. Whether you are announcing big company news or you are launching a new product, press releases have excellent reach and can be expertly targeted at specific demographic and geographic groups. Our copywriters have years of experience in writing press releases and will ensure you get maximum exposure. Most websites have a blog these days and with good reason. Blogs are a great way to post regular fresh content that keeps the search engines ranking your web pages high and a great way to keep in touch with your target audience. We can write daily, weekly or monthly blogs for you that will help to attract more traffic and more conversions. Did you know that your products and descriptions can be optimised for the search engines as well as your target audience? We will research the keywords that your potential leads are likely to use and optimise your descriptions so they are more likely to be found. 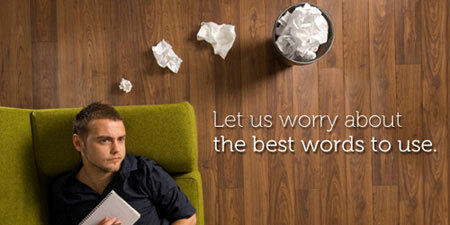 We would be delighted to tell you more about our SEO copywriting services and the power of online content. Contact us today to find out more and take your website to the next level.